This article explains how to back up and restore an Azure VM in an Azure Backup Recovery Services vault using PowerShell cmdlets. Create a Recovery Services vault and set the vault context. Trigger an on-demand backup job for the protected virtual machines Before you can back up (or protect) a virtual machine, you must complete the prerequisites to prepare your environment for protecting your VMs. Learn more about Recovery Services vaults. Review the architecture for Azure VM backup, learn about the backup process, and review support, limitations, and prerequisites. Review the PowerShell object hierarchy for Recovery Services. The object hierarchy is summarized in the following diagram. Review the Az.RecoveryServices cmdlet reference reference in the Azure library. The aliases and cmdlets for Azure Backup, Azure Site Recovery, and the Recovery Services vault appear. The following image is an example of what you'll see. It is not the complete list of cmdlets. Alternately, you can include your account credentials as a parameter in the Connect-AzAccount cmdlet, using the -Credential parameter. If you are CSP partner working on behalf of a tenant, specify the customer as a tenant, by using their tenantID or tenant primary domain name. For example: Connect-AzAccount -Tenant "fabrikam.com"
In the command output, the RegistrationState should change to Registered. If not, just run the Register-AzResourceProvider cmdlet again. The Recovery Services vault is a Resource Manager resource, so you need to place it within a resource group. You can use an existing resource group, or create a resource group with the New-AzResourceGroup cmdlet. When creating a resource group, specify the name and location for the resource group. 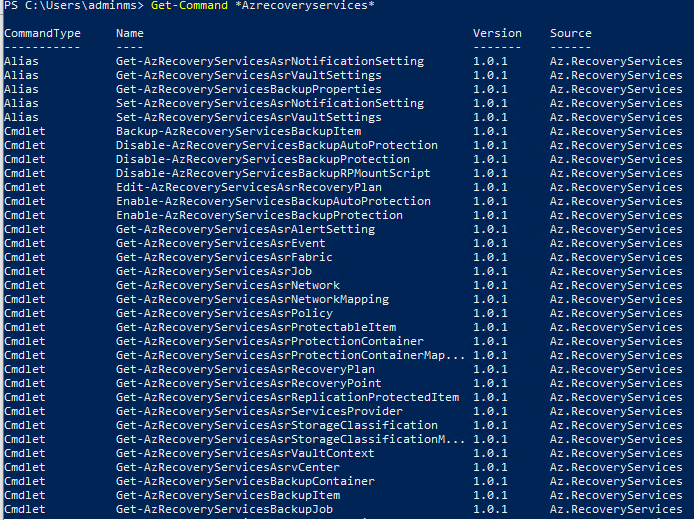 New-AzResourceGroup -Name "test-rg" -Location "West US"
Use the New-AzRecoveryServicesVault cmdlet to create the Recovery Services vault. Be sure to specify the same location for the vault as was used for the resource group. New-AzRecoveryServicesVault -Name "testvault" -ResourceGroupName "test-rg" -Location "West US"
$vault1 = Get-AzRecoveryServicesVault -Name "testvault"
The output is similar to the following example, notice the associated ResourceGroupName and Location are provided. Use a Recovery Services vault to protect your virtual machines. Before you apply the protection, set the vault context (the type of data protected in the vault), and verify the protection policy. The protection policy is the schedule when the backup jobs run, and how long each backup snapshot is retained. Before enabling protection on a VM, use Set-AzRecoveryServicesVaultContext to set the vault context. Once the vault context is set, it applies to all subsequent cmdlets. The following example sets the vault context for the vault, testvault. Storage Redundancy can be modified only if there are no backup items protected to the vault. When you create a Recovery Services vault, it comes with default protection and retention policies. The default protection policy triggers a backup job each day at a specified time. The default retention policy retains the daily recovery point for 30 days. You can use the default policy to quickly protect your VM and edit the policy later with different details. Use **Get-AzRecoveryServicesBackupProtectionPolicy to view the protection policies available in the vault. You can use this cmdlet to get a specific policy, or to view the policies associated with a workload type. The following example gets policies for workload type, AzureVM. The timezone of the BackupTime field in PowerShell is UTC. However, when the backup time is shown in the Azure portal, the time is adjusted to your local timezone. A backup protection policy is associated with at least one retention policy. A retention policy defines how long a recovery point is kept before it is deleted. Use Get-AzRecoveryServicesBackupRetentionPolicyObject to view the default retention policy. Similarly you can use Get-AzRecoveryServicesBackupSchedulePolicyObject to obtain the default schedule policy. The New-AzRecoveryServicesBackupProtectionPolicy cmdlet creates a PowerShell object that holds backup policy information. The schedule and retention policy objects are used as inputs to the New-AzRecoveryServicesBackupProtectionPolicy cmdlet. By default, a start time is defined in the Schedule Policy Object. Use the following example to change the start time to the desired start time. The desired start time should be in UTC as well. The below example assumes the desired start time is 01:00 AM UTC for daily backups. $schPol = Get-AzRecoveryServicesBackupSchedulePolicyObject -WorkloadType "AzureVM"
$UtcTime = Get-Date -Date "2019-03-20 01:00:00Z"
The following example stores the schedule policy and the retention policy in variables. The example uses those variables to define the parameters when creating a protection policy, NewPolicy. $retPol = Get-AzRecoveryServicesBackupRetentionPolicyObject -WorkloadType "AzureVM"
Once you've defined the protection policy, you still must enable the policy for an item. Use Enable-AzRecoveryServicesBackupProtection to enable protection. Enabling protection requires two objects - the item and the policy. Once the policy has been associated with the vault, the backup workflow is triggered at the time defined in the policy schedule. The following examples enable protection for the item, V2VM, using the policy, NewPolicy. The examples differ based on whether the VM is encrypted, and what type of encryption. $pol = Get-AzRecoveryServicesBackupProtectionPolicy -Name "NewPolicy"
Enable-AzRecoveryServicesBackupProtection -Policy $pol -Name "V2VM" -ResourceGroupName "RGName1"
To enable the protection on encrypted VMs (encrypted using BEK and KEK), you must give the Azure Backup service permission to read keys and secrets from the key vault. To enable the protection on encrypted VMs (encrypted using BEK only), you must give the Azure Backup service permission to read secrets from the key vault. If you are using the Azure Government cloud, then use the value ff281ffe-705c-4f53-9f37-a40e6f2c68f3 for the parameter ServicePrincipalName in Set-AzKeyVaultAccessPolicy cmdlet. To modify the protection policy, use Set-AzRecoveryServicesBackupProtectionPolicy to modify the SchedulePolicy or RetentionPolicy objects. The following example changes the recovery point retention to 365 days. PS C:\> $bkpPol = Get-AzureRmRecoveryServicesBackupProtectionPolicy -WorkloadType "AzureVM"
The default value will be 2, user can set the value with a min of 1 and max of 5. For weekly backup polices, the period is set to 5 and cannot be changed. Use Backup-AzRecoveryServicesBackupItem to trigger a backup job. If it's the initial backup, it is a full backup. Subsequent backups take an incremental copy. Be sure to use Set-AzRecoveryServicesVaultContext to set the vault context before triggering the backup job. The following example assumes the vault context was already set. $namedContainer = Get-AzRecoveryServicesBackupContainer -ContainerType "AzureVM" -Status "Registered" -FriendlyName "V2VM"
$item = Get-AzRecoveryServicesBackupItem -Container $namedContainer -WorkloadType "AzureVM"
The timezone of the StartTime and EndTime fields in PowerShell is UTC. However, when the time is shown in the Azure portal, the time is adjusted to your local timezone. You can monitor long-running operations, such as backup jobs, without using the Azure portal. To get the status of an in-progress job, use the Get-AzRecoveryservicesBackupJob cmdlet. This cmdlet gets the backup jobs for a specific vault, and that vault is specified in the vault context. The following example gets the status of an in-progress job as an array, and stores the status in the $joblist variable. $joblist = Get-AzRecoveryservicesBackupJob –Status "InProgress"
Instead of polling these jobs for completion - which is unnecessary additional code - use the Wait-AzRecoveryServicesBackupJob cmdlet. This cmdlet pauses the execution until either the job completes or the specified timeout value is reached. There is an important difference between the restoring a VM using the Azure portal and restoring a VM using PowerShell. With PowerShell, the restore operation is complete once the disks and configuration information from the recovery point are created. The restore operation doesn't create the virtual machine. To create a virtual machine from disk, see the section, Create the VM from restored disks. If you don't want to restore the entire VM, but want to restore or recover a few files from an Azure VM backup, refer to the file recovery section. The restore operation does not create the virtual machine. The following graphic shows the object hierarchy from the RecoveryServicesVault down to the BackupRecoveryPoint. To restore backup data, identify the backed-up item and the recovery point that holds the point-in-time data. Use Restore-AzRecoveryServicesBackupItem to restore data from the vault to your account. Create the VM from stored disks. To get the PowerShell object that identifies the right backup item, start from the container in the vault, and work your way down the object hierarchy. To select the container that represents the VM, use the Get-AzRecoveryServicesBackupContainer cmdlet and pipe that to the Get-AzRecoveryServicesBackupItem cmdlet. $namedContainer = Get-AzRecoveryServicesBackupContainer  -ContainerType "AzureVM" -Status "Registered" -FriendlyName "V2VM"
$backupitem = Get-AzRecoveryServicesBackupItem -Container $namedContainer  -WorkloadType "AzureVM"
Use the Get-AzRecoveryServicesBackupRecoveryPoint cmdlet to list all recovery points for the backup item. Then choose the recovery point to restore. If you are unsure which recovery point to use, it is a good practice to choose the most recent RecoveryPointType = AppConsistent point in the list. In the following script, the variable, $rp, is an array of recovery points for the selected backup item, from the past seven days. The array is sorted in reverse order of time with the latest recovery point at index 0. Use standard PowerShell array indexing to pick the recovery point. In the example, $rp selects the latest recovery point. Use the Restore-AzRecoveryServicesBackupItem cmdlet to restore a backup item's data and configuration to a recovery point. Once you identify a recovery point, use it as the value for the -RecoveryPoint parameter. In the above sample, $rp was the recovery point to use. In the following sample code, $rp is the recovery point to use for restoring the disk. $restorejob = Restore-AzRecoveryServicesBackupItem -RecoveryPoint $rp -StorageAccountName "DestAccount" -StorageAccountResourceGroupName "DestRG"
Provide an additional parameter TargetResourceGroupName to specify the RG to which managed disks will be restored. $restorejob = Restore-AzRecoveryServicesBackupItem -RecoveryPoint $rp -StorageAccountName "DestAccount" -StorageAccountResourceGroupName "DestRG" -TargetResourceGroupName "DestRGforManagedDisks"
The VMConfig.JSON file will be restored to the storage account and the managed disks will be restored to the specified target RG. Use the Wait-AzRecoveryServicesBackupJob cmdlet to wait for the Restore job to complete. Once the Restore job has completed, use the Get-AzRecoveryServicesBackupJobDetails cmdlet to get the details of the restore operation. The JobDetails property has the information needed to rebuild the VM. Once you restore the disks, go to the next section to create the VM. After you restore the disks, use the following steps to create and configure the virtual machine from disk. To create encrypted VMs from restored disks, your Azure role must have permission to perform the action, Microsoft.KeyVault/vaults/deploy/action. If your role does not have this permission, create a custom role with this action. For more information, see Custom Roles in Azure RBAC. After restoring disks, you can now get a deployment template which you can directly use to create a new VM. No more different PS cmdlets to create managed/unmanaged VMs which are encrypted/unencrypted. The resultant job details gives the template URI which can be queried and deployed. Just deploy the template to create a new VM as explained here. The following section lists steps necessary to create a VM using "VMConfig" file. It is highly recommended to use the deployment template detailed above to create a VM. This section (Points 1-6) will be deprecated soon. Query the restored disk properties for the job details. Set the Azure storage context and restore the JSON configuration file. Set-AzCurrentStorageAccount -Name $storageaccountname -ResourceGroupName "testvault"
Use the JSON configuration file to create the VM configuration. $vm = New-AzVMConfig -VMSize $obj. 'properties.hardwareProfile'.vmSize -VMName "testrestore"
Attach the OS disk and data disks. This step provides examples for various managed and encrypted VM configurations. Use the example that suits your VM configuration. Non-managed and non-encrypted VMs - Use the following sample for non-managed, non-encrypted VMs. Set-AzVMOSDisk -VM $vm -Name "osdisk" -VhdUri $obj. 'properties.StorageProfile'.osDisk.vhd.Uri -CreateOption "Attach"
$vm = Add-AzVMDataDisk -VM $vm -Name "datadisk1" -VhdUri $dd.vhd.Uri -DiskSizeInGB 127 -Lun $dd.Lun -CreateOption "Attach"
Non-managed and encrypted VMs with Azure AD (BEK only) - For non-managed, encrypted VMs with Azure AD (encrypted using BEK only), you need to restore the secret to the key vault before you can attach disks. For more information, see the Restore an encrypted virtual machine from an Azure Backup recovery point. The following sample shows how to attach OS and data disks for encrypted VMs. When setting the OS disk, make sure to mention the relevant OS type. Non-managed and encrypted VMs with Azure AD (BEK and KEK) - For non-managed, encrypted VMs with Azure AD (encrypted using BEK and KEK), restore the key and secret to the key vault before attaching the disks. For more information, see Restore an encrypted virtual machine from an Azure Backup recovery point. The following sample shows how to attach OS and data disks for encrypted VMs. Non-managed and encrypted VMs without Azure AD (BEK only) - For non-managed, encrypted VMs without Azure AD (encrypted using BEK only), if source keyVault/secret are not available restore the secrets to key vault using the procedure in Restore an non-encrypted virtual machine from an Azure Backup recovery point. Then execute the following scripts to set encryption details on the restored OS blob (this step is not required for data blob). The $dekurl can be fetched from the restored keyVault. The below script needs to be executed only when the source keyVault/secret is not available. $osBlobName = $obj. 'properties.StorageProfile'.osDisk.name + ".vhd"
After the secrets are available and the encryption details are also set on the OS Blob, attach the disks using the script given below. If the source keyVault/secrets are available already, then the above script need not be executed. Non-managed and encrypted VMs without Azure AD (BEK and KEK) - For non-managed, encrypted VMs without Azure AD (encrypted using BEK & KEK), if source keyVault/key/secret are not available restore the key and secrets to key vault using the procedure in Restore an non-encrypted virtual machine from an Azure Backup recovery point. Then execute the following scripts to set encryption details on the restored OS blob (this step is not required for data blob). The $dekurl and $kekurl can be fetched from the restored keyVault. The below script needs to be executed only when the source keyVault/key/secret is not available. After the key/secrets are available and the encryption details are set on the OS Blob, attach the disks using the script given below. If the source keyVault/key/secrets are available, then the above script need not be executed. Managed and non-encrypted VMs - For managed non-encrypted VMs, attach the restored managed disks. For in-depth information, see Attach a data disk to a Windows VM using PowerShell. Managed and encrypted VMs with Azure AD (BEK only) - For managed encrypted VMs with Azure AD (encrypted using BEK only), attach the restored managed disks. For in-depth information, see Attach a data disk to a Windows VM using PowerShell. Managed and encrypted VMs with Azure AD (BEK and KEK) - For managed encrypted VMs with Azure AD (encrypted using BEK and KEK), attach the restored managed disks. For in-depth information, see Attach a data disk to a Windows VM using PowerShell. Managed and encrypted VMs without Azure AD (BEK only) -For managed, encrypted VMs without Azure AD (encrypted using BEK only), if source keyVault/secret are not available restore the secrets to key vault using the procedure in Restore an non-encrypted virtual machine from an Azure Backup recovery point.Then execute the following scripts to set encryption details on the restored OS disk (this step is not required for data disk). The $dekurl can be fetched from the restored keyVault. After the secrets are available and the encryption details are set on the OS disk, to attach the restored managed disks, see Attach a data disk to a Windows VM using PowerShell. Managed and encrypted VMs without Azure AD (BEK and KEK) - For managed, encrypted VMs without Azure AD (encrypted using BEK & KEK),if source keyVault/key/secret are not available restore the key and secrets to key vault using the procedure in Restore an non-encrypted virtual machine from an Azure Backup recovery point. Then execute the following scripts to set encryption details on the restored OS disk (this step is not required for data disk). The $dekurl and $kekurl can be fetched from the restored keyVault. After the key/secrets are available and the encryption details are set on the OS disk, to attach the restored managed disks, see Attach a data disk to a Windows VM using PowerShell. $vnet = Get-AzVirtualNetwork -Name "testvNET" -ResourceGroupName "test"
For VM without Azure AD - Use the following command to manually enable encryption for the data disks. If incase during the command execution it asks for AADClientID, then you need to update your Azure PowerShell. Set-AzVMDiskEncryptionExtension -ResourceGroupName $RG -VMName $vm -DiskEncryptionKeyVaultUrl $dekUrl -DiskEncryptionKeyVaultId $keyVaultId -SkipVmBackup -VolumeType "All"
Set-AzVMDiskEncryptionExtension -ResourceGroupName $RG -VMName $vm -DiskEncryptionKeyVaultUrl $dekUrl -DiskEncryptionKeyVaultId $keyVaultId -KeyEncryptionKeyUrl $kekUrl -KeyEncryptionKeyVaultId $keyVaultId -SkipVmBackup -VolumeType "All"
In addition to restoring disks, you can also restore individual files from an Azure VM backup. The restore files functionality provides access to all files in a recovery point. Manage the files via File Explorer as you would for normal files. Use the Get-AzRecoveryServicesBackupRPMountScript cmdlet to get the script to mount all the disks of the recovery point. The disks are mounted as iSCSI attached disks to the machine where the script is run. Mounting occurs immediately, and you don't incur any charges. Run the script on the machine where you want to recover the files. To execute the script, you must enter the password provided. After the disks are attached, use Windows File Explorer to browse the new volumes and files. For more information, refer to the Backup article, Recover files from Azure virtual machine backup. After the required files are copied, use Disable-AzRecoveryServicesBackupRPMountScript to unmount the disks. Be sure to unmount the disks so access to the files of the recovery point is removed. If you prefer to use PowerShell to engage with your Azure resources, see the PowerShell article, Deploy and Manage Backup for Windows Server. If you manage DPM backups, see the article, Deploy and Manage Backup for DPM.